The battery electric city car will be launched in the US next year initially as a lease vehicle. Unveiled today, the Fit EV will be hitting the US streets next summer as Honda announced plans to lease the battery electric commuter to select markets in California and Oregan, followed by six East Coast markets by 2013. The driving range of the of the Fit EV, based on the popular Fit (Jazz in Europe), has been estimated at 123 miles per charge, which translates to a 76 mile range when combined with adjusted city and highway ranges. Powered by a 20kWh lithium-ion battery and a 92 kilowatt coaxial electric motor, the result is excellent efficiency and power at relatively high speeds. A 3-mode electric drive system adapted from the CR-Z Sport Hybrid can be used to maximize efficiency and improve acceleration. A 17 percent driving range increase is available in Econ mode when compared to Normal, and Sport mode improves acceleration significantly with the aim of making it more fun to drive. The 6.6kW onboard 32amp charger allows for convenient recharging and with a 240-volt charger a full recharge is possible in just three hours. Mirroring the petrol-powered Fit the exterior will be available exclusively in Reflection Blue Pearl, and will have a chrome front fascia, EV badges, distinctive five-spoke alloys, and an aerodynamic rear spoiler. Inside a bio-fabric covers the seating surfaces, a standard telematics system allows the driver to remotely view the vehicle&apos;s state of charge and initiate charging, and the Fit EV will also be equipped with a Honda Satellite-Linked Navigation System that helps to locate charging stations and that also supplies updated traffic information. 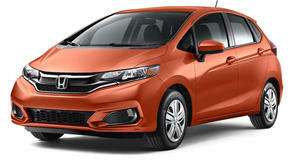 The MSRP of the Fit EV is $38,675, and the lease price is estimated at $399 per month. Honda expect 1,100 models to be produced over the next three years based on early market responses.